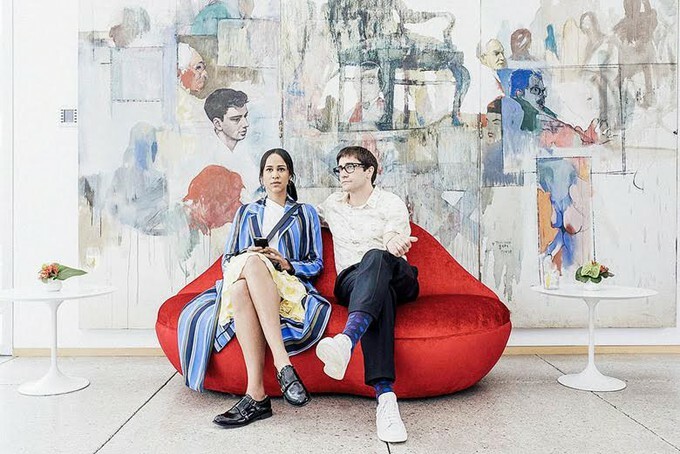 Eloy's "VELVET BUZZSAW" Review- HEAVY SPOILERS! One movie removed from Nightcrawler, his astonishing, darkness-soaked directorial debut, Dan Gilroy reunites with previous collaborators Jake Gyllenhaal and Rene Russo before the cameras and cinematographer Robert Elswit and editor John Gilroy behind them to reach the exact opposite end of the emotional spectrum and deliver VELVET BUZZSAW, a constantly funny, occasionally gut-bustingly hilarious send-up of the art world and the trend-setting, vacuous lifestyle in the L.A. micro-verse, specifically. However, the same way it happens with the gorgeous original art featured herein, there is way more than meets the eye. The movie follows an Altmanesque tapestry of characters directly or obliquely affected by the arrival of the latest, hottest painter into the scene. Josephina (Zawe Ashton), an assistant to art dealer Rhodora (Rene Russo), arrives at her apartment building only to come across one of her neighbors’ dead body. Upon closer inspection, she discovers a treasure trove of original, heretofore never-seen paintings and sketches inside his apartment, the entirety of which, according to their landlord, was to be destroyed after his death in concordance with the deceased’s strict instructions. Josephina takes it all in instead, of course, and she promptly asks for the professional opinion of art critic/part-time lover Morf Vandewalt (Gyllenhaal). He agrees with her greedily hopeful instinct and this turns out to be the discovery of the century; the consequent frenzy sends everyone- fellow artists, dealers, collectors- down a path rapidly covering with everyone’s worst impulses. The mandatory research into the background of Vetril Dease´s life, the posthumous sensation, unearths a childhood beset by abuse and his eventual lonely adulthood defined by an unending string of menial jobs and rumors surrounding the mysteriously unexplained deaths of certain people surrounding him and his likely involvement in them. This transparent homage/adaptation of outsider artist Henry Darger’s life and art (which in reality encompassed literature as well as painting) feels not only just but necessary as well, providing the exact scary-campfire-tale atmosphere to veil the nightmarish events to come. This plot, however, is clearly nothing but an excuse to sometimes observe, more often simply deride, a cast of characters crammed full with potential for ridicule: Piers (a deliciously peevish John Malkovich), the erstwhile superstar artist now engulfed by sobriety-induced lack of inspiration (“Easy boy. Not yet”, he soothes his growling dog as they let a potential new dealer into their house); Jon Dondon (Tom Sturridge), playing said dealer with a snake-oil salesman’s appropriately oily shamelessness (“This is remarkable”, he mutters as he contemplatively beholds a heap of bulging trash bags in Piers’ workshop; “It´s not art”, the latter dryly explains); Bryson (Billy Magnussen), a disgruntled installer and handyman in Rhodora’s gallery with higher aspirations (“I’m really an artist, you know? I did, um, Bandini’s Froot Loop Hippo, you know that? And I glued on all the Froot Loops); Josephina herself, a fiercely ambitious aspiring player dead set on extricating herself from the rest of the unenlightened world (“Is that tobacco?”, Morf asks her as she vapes away; “Hash oil”, she clarifies). This is a baroque world on and outside the canvases, one where taste is fickle and the sources for preference - and theft- become ultimately incestuous as proven by Coco (Stranger Things’ Natalia Dyer, taking full advantage of a small role that nevertheless allows her to finally demonstrate her talent), a front desk girl who, in one of the best running gags, keeps changing employers as fast as she discovers their corpses. Gyllenhaal is, despite his somewhat brief screentime, hands down the brightest spot among purely stellar performances, though. Morf’s effeminacy can be often hilarious but hidden right beneath it lies an unapologetically cutthroat approach to his criticism in particular and life in general. Gyllenhaal firmly grounds it on a just barely heightened reality that allows him to plausibly play the rest of this fully fleshed out persona - horror, glee, condescension, he visits all emotional recesses and, at all times, we perceive exactly what he and Gilroy want us to. His insistence on choosing offbeat parts has continually kept him shut off from widespread, vastly deserved recognition but he stands, right now, as one of the most gifted and interesting actors working, period. Which brings me to Dan Gilroy’s screenplay, a crackerjack display of broad comedy- sometimes buffoonish, even- carefully wrapped by delicious wit. 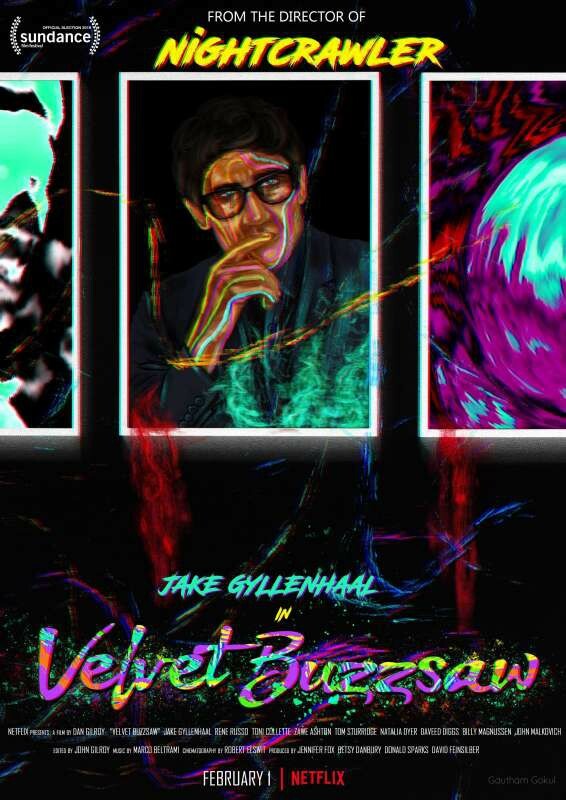 Combining the most traditional sensibilities of a Coen brothers’ effort (VELVET BUZZSAW, if anything, resembles an expansion of the underground art circle introduced in The Big Lebowski, Gyllenhall’s Morf a slightly more reined in variation on David Thewlis’ Knox Harrington) with his own personal interests he offers highbrow authenticity to complement the rest of the more obvious farce and in the process delivers some honestly uproarious dialogue. Contrary to what I heard- and probably you, too- the film is most definitely not an abstract, puzzle box movie but, instead, as linear as it is formal in its storytelling; if midway down the road its zagging comes off as unexpectedly surreal after its initially straightforward zigging is probably due to a conscious effort from Gilroy to rib art- in whichever form you choose to consume it- and its occasional proclivity for shrouding itself with inscrutable trappings and obscure self-reflection. In VELVET’S case, such stylings come in the form of a brusque turn into the supernatural partway through. While carefully examining Dease’s work, the lab results uncover the presence of tissue- as in blood serum, presumably the artist’s- in the paint mix, apparently used for the creation of the reddish blacks and shadows. Then, the people who have found themselves in the vicinity of any of his art start dying. In very strange ways. As Morf states it, “…And this is hard to admit, as an adherent of the here and now and a denier of childish belief, but something truly goddamn strange is going on!”. This metamorphosis into a would-be mystical slasher would likely feel downright dissonant if Gilroy opted to approach it with the same embarrassed skepticism any given one of his characters would adapt themselves but he does it with gusto, embracing the comedy/horror combo with the enthusiasm one would expect from a Raimi or Jackson endeavor. In, arguably, the most memorable bit (and the most Coen-like), Gretchen (Toni Collete), an art advisor to an anonymous collector, dies in a most gruesome way and drops on a pool of her own blood smack-dab in the middle of the gallery; the next morning the security staff, thinking it is part of the exhibit, open up the place and let everyone in until, hours later, her assistant arrives and clears things up with a horrified scream. The imagery is fascinatingly inventive if not outright creepy at all times and Elswit, probably inspired by the overall infatuation with art suffusing the proceedings, intersperses some of the most gloriously magical vistas of L.A. I’ve ever seen. A painting becomes restless and the monkeys depicted therein reach out of the canvas and into our world with murderous intent and, in a fantastically psychedelic sequence, one character is engulfed by the paint melting off of all the art surrounding her until she becomes, literally, graffiti on a wall. It is a twofold proposition and depending on your mood it can work wonderfully as either playful spookfest or dark satire. The fact that even after delving somewhat profoundly into its inner workings anyone can obtain from it everything it has to offer stands as the greatest testament to Gilroy’s increasingly obvious talent. “What does it say?”, asks an attendee at Dease’s exhibit, thoroughly flummoxed, but the one beside him, impervious, slyly retorts, “What do you feel?”.